With the explosion in preparedness-related supplies and equipment over the last decade, there have been tremendous advancements in food, equipment, supplies, and training. But I sometimes wonder if people give enough attention to water. After all, water is so common, ordinary, and available that we sometimes forget what its absence is like and how critical it is for our very survival. Water is for more than just drinking, though obviously that’s essential. Without the ability to wash clothes, dishes, or our bodies, things get very dirty very quickly — and this can have a tremendous psychological impact during emergencies. Americans take clean and abundant water for granted. When it disappears, it can be crushing. Water-borne diseases have a long and honorable history of decimating human lives. Just because these diseases are no longer common in America doesn’t mean they’ve been eradicated. If water sources become contaminated, disease can rear its ugly head within days or even hours (hence the “boil” orders which often hit urban areas if water purification systems are compromised). In short, you don’t want to mess around when it comes to clean water. But from a preparedness standpoint, water can be frustrating. Unlike food and other supplies, you can’t compress, miniaturize, freeze-dry, or lighten water (much less “dehydrate” it). Therefore your water options come down to two choices: storing and purifying. Both are critical and necessary for a prepared lifestyle. Since the very definition of an emergency means you don’t know when it will hit, storing water at home is essential so you’re not caught unprepared. Everybody gives lip service to this idea, but few people actually do it. I can speak from experience about the need for stored water — when we lose power, our electric well pump doesn’t work — and stored water has saved our bacon many times. The minimum amount to store is one gallon per person per day. One gallon each should be sufficient for drinking and moderate cooking purposes, but will not be enough for washing clothes, dishes, or people (except a modest sponge bath), or for flushing toilets. Store an additional gallon per person per day for purposes of washing and bathing. Consider storing more if any family member has special needs (heavy-labor jobs, nursing mothers, etc.). 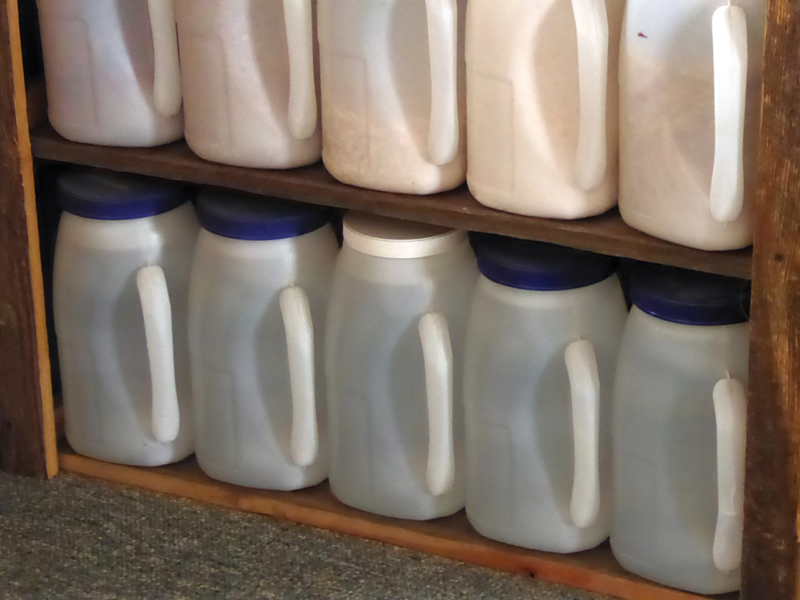 Smaller jugs like these 1-gallon plastic mayonnaise containers or 2-liter soda bottles are very convenient for storing water here and there when you don’t have room for a 55 gallon drum or other larger water storage vessel. This leads to another problem with water: weight. Water weighs 8.5 lbs. per gallon, and the weight of stored water needs to be factored into your living quarters. A 50-gallon barrel of water weighs 425 lbs. It’s best to distribute the weight rather than having it centered in one spot, unless your floors are concrete and can bear heavy weights. Standard domestic construction requirements mandate a house or apartment floor be constructed to handle a live load of 40 pounds per square foot (psf). Bathroom floors are usually constructed for a higher psf load to handle the weight of full bathtubs. We have a concrete floor in our home, so we can store heavy loads without a problem. We routinely keep two 50-gallon barrels of water stored at all times, as well as another 10 gallons or so in one-gallon jugs stashed in various places. 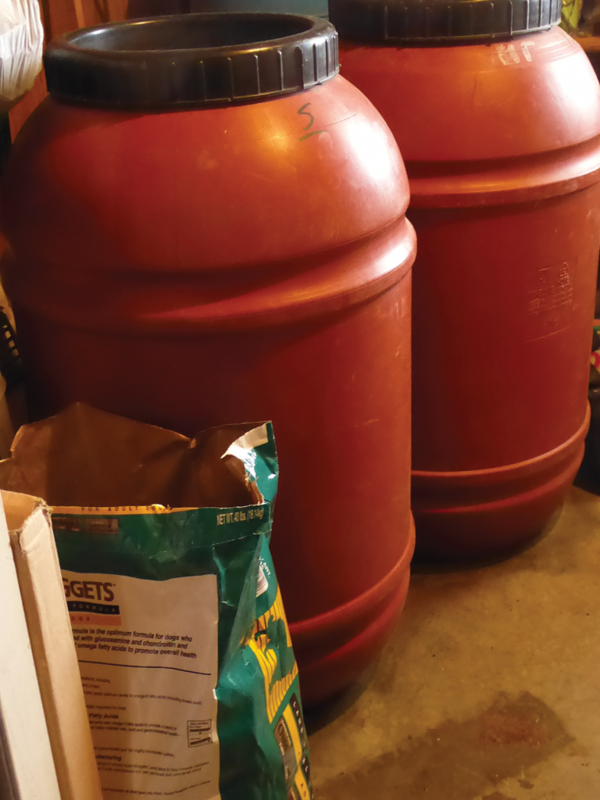 If you have a basement, you can store several large barrels of water. If you live in a climate where freezing temperatures are rare, you can store large amounts of water outside. An IBC tote (intermediate bulk container) like this one stores between 275-330 gallons of water depending on the exact dimensions, fits in a truck bed, and can be moved with a forklift or tractor with fork attachment. Photo by Mattea Bechini. But if you’re in an apartment or other living quarters where large and heavy loads are not practical or safe, you need to be more creative in your storage options. Two-liter soda bottles (rinsed, of course) make excellent water storage containers. We store water in cleaned one-gallon plastic mayonnaise jugs from Costco. Whatever container you use, these can be distributed around your living space to keep weight problems to a minimum. Storing water in milk or fruit juice jugs is not recommended. Not only does the plastic become brittle and break down with age, but milk proteins and fruit sugars do not remove easily (even with rinsing) and will lead to a growth environment for bacteria with stored water. For inexpensive high-volume home storage, consider a WaterBob (www.waterbob.com). This is a heavy-duty clear sealable plastic bag you can put in your bathtub, fill from the tap, and then access with a detachable siphon pump. It can hold up to 100 gallons. While a bathtub is suitable for containment (and offers ease of filling), this unit can be placed anywhere it can be supported and filled (and properly drained when the time comes). The manufacturer says it will keep untreated water safe for about four months. For longer storage, water should be treated with regular unscented chlorine bleach (eight drops per gallon). Bleach loses efficacy after about 14 months, so always keep fresh bleach on hand. You can also store treated water in sealable food-grade five-gallon buckets, but bear in mind the weight factor. Each five-gallon bucket will weigh more than 40 pounds. Unless these are stored on a concrete floor, they should be placed against a wall where floor strength is the greatest; and they should not be stacked, especially in earthquake-prone areas. And don’t forget, your hot water tank can provide up to 50 gallons of potable water. The water in water beds is not considered potable since there are usually poisonous chemicals added to inhibit algae and bacteria growth; however such water could be used for flushing toilets. When choosing water-storage containers, make sure they’re food-grade. Don’t use plastic trash cans, for example, since these are often treated with pesticides and may contaminate the water. With a little ingenuity you can store hundreds of gallons of water in your home or apartment. But no matter how cleverly or abundantly you store water, eventually you’ll run out (or you may find yourself fleeing your home). That’s why the second recommendation, purification and filtration, is critical. But I have a swimming pool! Some people think swimming pools are suitable for drinking sources since the water is chlorinated and therefore safe — right? Just think of it, tens of thousands of gallons of conveniently stored water! What could possibly go wrong? Everything. Swimming pools are indeed kept clear by use of chlorine; but pool chlorine contains stabilizers, which neither dissipate nor evaporate. In fact, they stay in the water, increasing every time additional pool chlorine is added to the water. Dissolved mineral solids from pool chemicals can have a laxative effect. Think about the implications of this under emergency conditions. Pool chlorine is often stabilized with cyanuric acide, a derivative of cyanide. Swimming pools often contain hair, skin particles, and even chlorine-resistant microscopic parasites such as giardia, stuff you really don’t want to drink. Boiling pool water only concentrates pool chemicals and dissolved solids. Without power, a swimming pool’s filtration system shuts down. This leads to the growth of algae and other microbes within days. So no, do not drink from your swimming pool. However pool water may be used for bathing and flushing toilets. 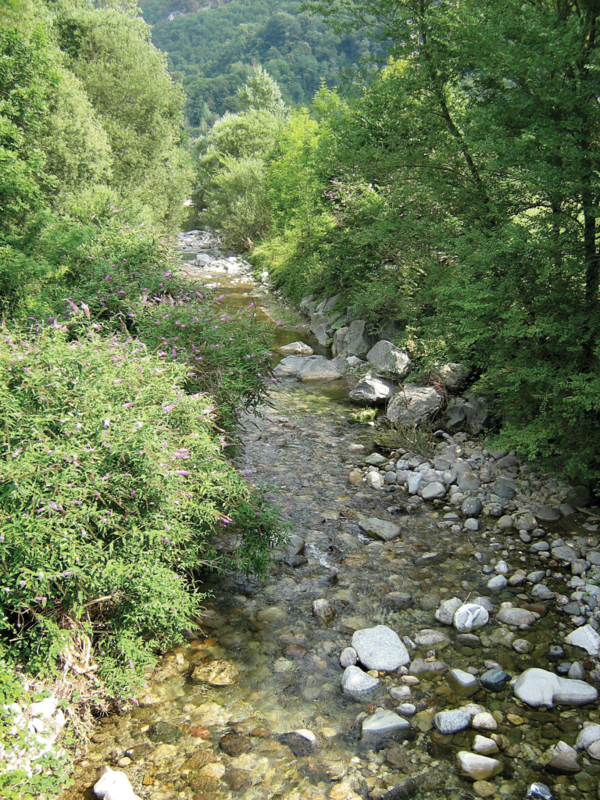 When attempting to capture and use water from outside sources — roof runoff, streams, lakes, etc. — it is essential to filter and purify the water, no matter how clean it appears. History is rife with nasty diseases caused by unclean water. What is the difference between water filters and water purifiers? Water filters work by physically straining out protozoan cysts (such as cryptosporidium and Giardia lamblia) and bacteria (such as E. coli, salmonella, campylobacter, and shigella), as well as fine-grained particles. Filters work by utilizing an internal cartridge with microscopic pores to catch debris, bacteria, and protozoa. Over time, these cartridges get clogged, so they must be cleaned and eventually replaced. We keep these two 55-gallon barrels full of water at all times. Water purifiers also combat viruses, which are too tiny for most filters to effectively catch (such as hepatitis A, rotavirus, and norovirus). Purifiers often utilize chemicals to kill viruses, which are too small for most filter elements. Some purifiers also use ultraviolet light to treat the pathogens. Often a filter or purifier will incorporate activated carbon (a form of carbon processed to have small, low-volume pores which increase the surface area available for adsorption or chemical reactions) to remove unpleasant tastes from water. Activated carbon can also reduce contaminants like pesticides and other industrial chemicals. The most familiar and common methods used for water purification are boiling, or adding bleach or iodine. Iodine. Of available choices, iodine is the least-recommended, as it has an unpleasant aftertaste; however it does work. Use doses of 12 drops/gallon (increase the dosage if the water is of dubious quality). Mix well and allow to stand for 30 minutes. Do not use iodine if you are pregnant or may become pregnant since iodine can cause fetal deformation or a miscarriage. Anyone with thyroid problems or allergic reactions to eating shrimp should also avoid iodine. Boiling. Unclean water must be boiled (at a rolling boil) for 7 to 10 minutes. This is fuel-intensive, but this action will kill most harmful viruses and bacteria. It will not, however, remove dangerous chemicals. Only filtering can do that. Distilling water is an acceptable option, if you have the setup and sufficient fuel. Water is heated to boiling and the steam is captured, condensed, and collected, leaving contaminants behind. Volatile chemicals are also boiled off during distillation. Bleach. For purifying unclean water, unscented bleach is a popular option. Remember, stored bleach loses efficacy after about 14 months, so only fresh bleach should be used. If the water is cloudy to begin with, add twice as much bleach. Mix well and wait 30 minutes. The water should have a slight bleach-y odor. If not, repeat the dose, wait 15 minutes, and smell again. A variation on bleach purification is water purification tablets, which use chlorine dioxide. Each foil-wrapped tablet is suitable for purifying one quart of water. These tablets meet U.S. EPA purification guidelines and will destroy viruses and bacteria in 15 minutes, giardia in 30 minutes, and cryptosporidium in 4 hours. Unlike liquid bleach, unopened tablets have a shelf life of three to four years. Filtration. The purchase of a water filter for emergency water filtration is strongly recommended. There are two main types of water filters: hand-filters (often found in camping stores) and stand-alone gravity filters. Stand-alone countertop filters, such as the Berkey (www.berkeyfilters.com), are pricey but efficient. Essentially you pour water in the top and it comes out the bottom. I’ve seen Berkeys in regular use in households where well water is questionable. For water purification while camping, collapsible bag filters, such as those made by Platypus or Sawyer, are effective. 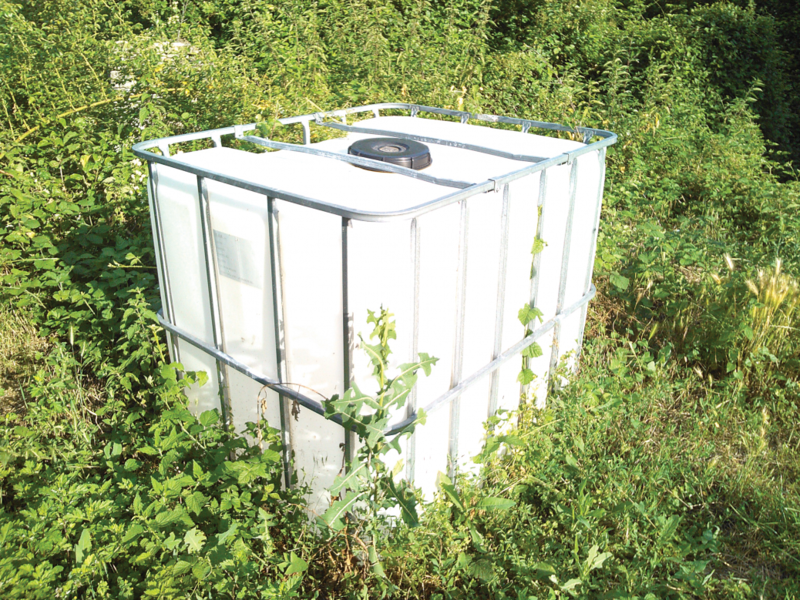 These gravity filters use a two-bag system suspended from a branch or hook. The upper bag is filled with water, then filtered into a lower bag within minutes with no pumping involved. For direct drinking — literally, directly drinking from a stream or pond — the LifeStraw is the classic in its field. At $20 each, they’re a highly affordable option for emergency filtration; however their useful lifespan is limited to 264 gallons. There are also numerous brands of squeeze water-bottle filters on the market that work well. For filtering water for cooking or drinking, many brands of hand pump filters are available. These filters can be hard to pump (since the water is usually forced through ceramic), but are highly effective at their job. Of all the water options available, clearly some are more suited to times when you’re stranded at home (“bugging in”), and others for when you’re forced to flee your home (“bugging out”). For bugging in, store as much water as you viably can, and have backup filters and purifiers for additional water. A combination of a countertop filter and chemical purifiers (bleach, tablets, etc.) are best. A LifeStraw for every family member is also recommended as an emergency backup. For bugging out, you need to think “portability.” Are you bugging out in a vehicle or on foot? The distinction will determine how much water you can bring. For vehicular evacuations, consider bringing a minimum two gallons per person for one week’s time. For a family of four, this means 42 gallons of water. You may or may not be able to fit this much water into your vehicle on top of all the other supplies you’ll need, so be practical. Gravity bag filters and individual filters are strongly recommended (I routinely suggest one LifeStraw per family member be kept in a vehicle at all times). Life gets far more complicated if you’re bugging out on foot, a highly dangerous situation. As mentioned before, water is heavy, and you simply won’t be able to carry 40 lbs. of water in addition to your other essentials. Consider keeping a two-liter container of clean water in each person’s bug-out bag, along with a LifeStraw or squeeze-bottle filter. Additionally, water purification tablets are small and lightweight and should be in every bug-out bag. Things to consider if you’re mobile and need to replenish your water supplies: If at all possible, avoid taking water from farm irrigation ditches or anywhere that flows through industrial areas. Sources from fresh rainfall or clean snow or springs are likely cleanest. However, to reiterate, all outside water is potentially contaminated, no matter how clean it looks. Streams and lakes may look crystal-clear, but some of the most dangerous and debilitating pathogens won’t make themselves known until it’s too late. True story: I knew someone who was an avid backpacker. Hot and thirsty on a hike, he stopped at a stream, looked at the gloriously clear water chattering over shiny rocks, and thought he should just scoop up some water to drink. But as an experienced outdoorsman, he knew better. Instead, he used his ceramic filter to clean the water before drinking. A few minutes later, his thirst quenched, he continued upstream, turned a corner, and saw a dead and rotting deer carcass in the middle of the stream. Lesson: You never know when outdoor water is contaminated, even if it looks clear. One person. That’s all it takes. I know that person won’t be you, of course, but it also means you can’t trust any water to be clean and free of contaminants in the event of a natural disaster. Dirty water can result in diarrhea, which in turn can lead (rapidly) to dehydration. Under normal conditions this affliction is just an annoyance. Under stressful or post-disaster conditions, it can be fatal, particularly for the elderly, the young, and the sick. To hammer and hammer and hammer the same point over and over: This is why you must store clean water, and have the means to purity other water, in your disaster preparedness supplies. The old Nike slogan of “Just Do It” is, in my opinion, one of the most brilliant and succinct slogans ever developed. Sadly, most people will ignore even something as vital as storing water because they never get around to it. Water is only second to air as a requirement of life. Make sure you have enough to get you through a bad time, and a way to safely acquire more if that bad time exceeds your supplies.